Emergency personnel respond to the scene after two explosions went off near the finish line of the Boston Marathon on Monday. Three killed - including 8-year-old boy - in bomb blasts near finish line of Boston Marathon, officials say. Area hospitals say at least 144 are injured, including eight children. Two explosions happened at about 2:50 p.m., more than two hours after the first of the race's nearly 27,000 runners had crossed the finish line. Boston.com journalist tells CNN "blood everywhere," people missing limbs. [Update, 11:05 a.m. ET Tuesday] This post is no longer being updated. For Tuesday's coverage, please read this story. [Update, 11:41 p.m. ET] Stephen Segatore, a nurse who was at the medical tent near the finish line for the Boston Marathon, said emergency responders immediately went into mass-casualty mode. "We had full trauma response at the scene," he told CNN. "We had physicians, nurses who are experienced in trauma care. We had EMTs and it was a full Level 1 trauma experience." Segatore said he treated at least 25 people as those experienced in trauma care stepped forward while others treated people with minor injuries. [Update, 11:35 p.m. ET] Saudi ambassador to the United States Adel Al-Jubeir condemned the bombings in Boston and offered his condolences to victims' families. “What occurred today in Boston is a heinous crime which contradicts the values of humanity.” he said. [Update, 10:52 p.m. ET] The total of injured has risen to 144 people, officials at Boston area hospitals said. That includes three additional patients at Brigham and Women’s Hospital. [Update, 10:41 p.m. ET] A law enforcement source in Boston tells CNN that investigators have a "number of active leads, and some good early progress in the forensics analysis." [Update, 10:07 p.m. ET] Dr. Peter Fagenholz told reporters that there were 29 wounded people at Massachusetts General Hospital, eight of whom were in critical condition. Many of the people had shrapnel injuries to their lower extremites, he said. "We have performed several amputations," he said. There were no pediatric patients among the wounded, he said. [Update, 9:38 p.m. ET] Dr. Allan Panter, who was near the finish line waiting for his wife who was running the race, told CNN he was standing about 20 to 25 feet from the first blast. He said he treated victims on the street after the explosion. "I saw at least six to seven people down next to me," he said. "They protected me from the blast. One lady expired. One gentleman lost both his (lower) limbs. Most of the injuries were lower extremities. I could not figure out why the young lady had expired. I could not find any injury on her thorax." [Update, 9:28 p.m. 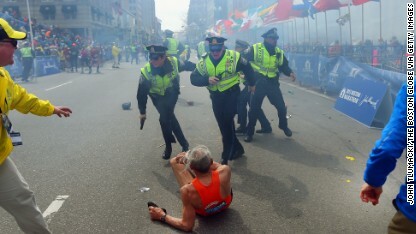 ET] Bill Iffrig, seen in video wearing an orange tank top and being blown over as he approached the finish line, told CNN's Piers Morgan that he was feeling OK after the blast. "I got down to within about 15 feet of the finishing apron and heard just tremendous explosion, sounded like a bomb went off right next to me, and the shock waves just hit my whole body and my legs just started jittering around," he said. "I knew i was going down and so i ended up down on the blacktop." Iffrig, 78, said he was assisted by one of the event volunteers, who helped him up so he could finish the race. After that, the worker looked for aid for Iffrig, who had just a scratch from his fall. "He insisted on getting a wheelchair over there so we started to do that, but then before that was rounded up, i said my hotel's about six blocks away so I think I can make it okay. So they let me get out of there and I went on home to my wife." [Update, 8:55 p.m. ET] A Saudi national with a leg wound was under guard at a Boston hospital in connection with the bombings at the Boston Marathon, but investigators cannot say he is involved at this time and he is not in custody, a law enforcement official said Monday evening. [Update, 8:54 p.m. ET] Three people were killed in the bombings, Boston Police Commissioner Ed Davis told reporters Monday night, raising the toll by one. [Update, 8:52 p.m. ET] The FBI is taking the lead in the investigation, Rick DesLauriers, FBI Special Agent in Charge of the Boston field office, told reporters. [Update, 8:44 p.m.ET ] The Boston Celtics home game against the Indiana Pacers, originally scheduled for Tuesday, was canceled, the NBA announced. With the regular season almost at its end, the contest will not be made up. [Update, 8:36 p.m. ET] Investigators have warned law enforcement officers to be on the lookout for a "darker-skinned or black male" with a possible foreign accent in connection with Monday's bombings at the Boston Marathon, according to a law enforcement advisory obtained by CNN. [Update, 8:35 p.m.] Hospital workers have treated 141 people after the Boston Marathon bombings, officials at those facilities said Monday night. Two people died in the terror attack, including an 8-year-old boy, a state law enforcement source said. [Update, 8:32 p.m.] A statement has been issued by the race organizers: "The Boston Athletic Association extends its deepest sympathies to all those who were affected in any way by todays events. "Today is a sad day for the City of Boston, for the running community, and for all those who were here to enjoy the 117th running of the Boston Marathon. What was intended to be a day of joy ...and celebration quickly became a day in which running a marathon was of little importance. "We can confirm that all of the remaining runners who were out on the course when the tragic events unfolded have been returned to a community meeting area. "At this time, runners bags in Boston which remain unclaimed may be picked up by runners presenting their bib number or proof of race participation at the Castle, at 101 Arlington Street, in Boston. "At this time, we are cooperating with the City of Boston, the Commonwealth of Massachusetts, and all federal law enforcement officials. "We would like to thank the countless people from around the world who have reached out to support us today." [Update, 7:57 p.m. ET] Doctors are "pulling ball bearings out of people in the emergency room," a terrorism expert briefed on the investigation told CNN's Deborah Feyerick. The same source said the blasts resulted in at least 10 lost limbs. [Update, 7:43 p.m. ET] An 8-year-old boy was among those killed, a state law enforcement source said, according to CNN's John King. [Update, 7:38 p.m. ET] At least 132 people - including eight children - have been injured in the bombings, according to Boston-area hospitals. Boston police earlier said that two people were killed. At least 17 of the injured are in critical condition, and at least 25 are in serious condition, area hospitals said. [Update, 7:08 p.m. ET] A witness, Marilyn Miller, told CNN that she was about 30 feet away from the first bomb when it went off. The second bomb came about 12 seconds after and about 50 to 100 yards away from the first, according to authorities and an analysis of video from the site. Miller was waiting for a runner who, it turns out, was probably about 10 minutes away from the finish line. "We saw injuries all around us," Miller said. Someone was putting pressure on a woman's neck. "A little boy, his leg was torn up. A woman, (people) were (shouting), 'Critical, critical, get out of out way!'" [Update, 6:51 p.m. ET] At least 110 people have been injured in the bombings, according to Boston-area hospitals. [Update, 6:49 p.m. ET] Boston cell phone services were overloaded in the wake of the blast, slowing the city's network dramatically and hampering the investigation in the early going, federal law enforcement officials told CNN. Unconfirmed rumors began circulating on social media and elsewhere that law enforcement had shut down cell service to prevent more explosives from being detonated remotely. But mobile companies were saying that was never the case, CNN's Doug Gross reports. "Verizon Wireless has not been asked by any government agency to turn down its wireless service," a spokesman for that company told CNN. "Any reports to that effect are inaccurate." In other media reports, Sprint similarly denied being asked to shut down service. Online, Bostonians were being encouraged to stay off of their mobile phones except for emergencies and even open up their wireless connections to help take the load off of the cellular data network. "If you live or run a business in #Boston near bombsite (please) open your wifi for people to use," tweeted Disaster Tech Lab, an Irish nonprofit dedicated to providing technology to assist in emergency situations. [Update, 6:47 p.m. ET] Initial tests indicate that the two bombs were small and possibly crude, with the tests not indicating any high-grade explosive material was used, a federal law enforcement official with knowledge of the investigation told CNN national security contributor and former homeland security adviser Fran Townsend. The source said the FBI considers the incident a terrorist attack, "but they've made clear to me they do not know at this time whether those responsible for the attack were a foreign or domestic group," Townsend said. A woman comforts another, who appears to have suffered an injury to her hand. [Update, 6:35 p.m. ET] U.S. Rep. Bill Keating, D-Massachusetts, said an unexploded device was found at a hotel on Boylston Street, and another unexploded device was found at an undisclosed location. Keating, who is a member of the House Homeland Security committee and has spoken to law enforcement sources, tells CNN's Dierdre Walsh that the incidents were a "sophisticated, coordinated, planned attack." 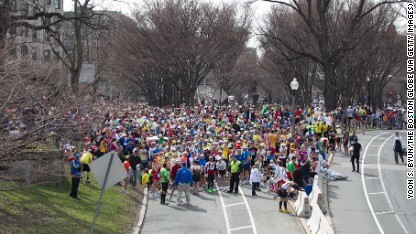 Runners who had not finished the race were stopped before the Massachusetts Avenue overpass on Commonwealth Avenue. [Update, 6:14 p.m. ET] More from President Obama, who just wrapped up his brief statement at the White House: "We still do not know who did this or why ... but make no mistake: We will get to the bottom of (this). We will find out who did this. We will find out why they did this. ... Any responsible groups will feel the full weight of justice." [Update, 6:11 p.m. ET] President Barack Obama is speaking about the bombings now: “The American people will say a prayer for Boston tonight, and Michelle and I send out deepest thoughts and prayers to the victims," Obama said at the White House. 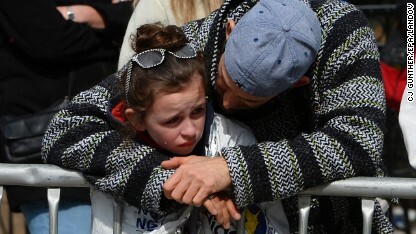 A man embraces a young girl after the attacks. [Update, 5:59 p.m. ET] John Manis, an eyewitness in his 50s, was about 200 feet away from the finish line near the Prudential building when the bombings occurred. He felt the blast to the point that it made him and others around him jump in the air, and some others around him fell down on the ground, he said, according to CNN's Eden Pontz. Manis said he heard two blasts about five seconds apart. He said there was confusion all around him, and he was hustled into the nearby Mandarin Hotel. Officials wouldn’t let them leave the hotel for a bit, and he says all who were there were all frisked by police. He said that when he left, he saw broken storefronts and lots of blood. 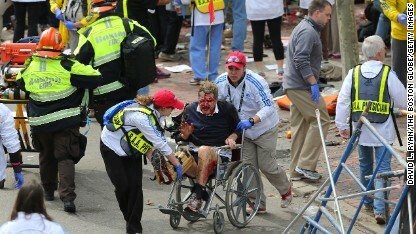 A man comforts a victim on the sidewalk at the scene of the first explosion. [Update, 5:51 p.m. ET] President Barack Obama is expected to deliver a statement at about 6:10 p.m. ET from the White House. 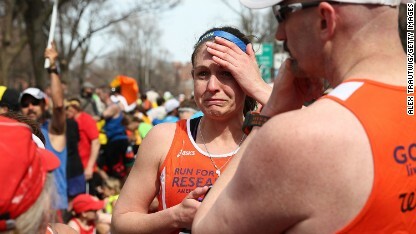 A runner reacts near Kenmore Square after the two terrorist bombings near the Boston Marathon’s finish line. [Update, 5:35 p.m. ET] Google has established a person-finder related to the Boston bombings. People who are looking for someone or have information about someone can make reports there. [Update, 5:31 p.m. ET] Boston police now appear to be backing away from their commissioner's earlier statement that a third incident - at the JFK Library 5 miles from the finish line - might have been related to the Boston Marathon blasts. On Twitter, Boston police say: "Update JFK incident appears to be fire related." An injured person is taken away from the scene. [Update, 5:17 p.m. ET] In the video below, a man describes the initial blast, saying the impact was so strong it “almost blew my head off.” He was not injured, but saw many people sustain horrific injuries. [Update, 5:15 p.m. ET] The Boston Globe is reporting a much higher injury count. They report that more than 100 people are being treated for injuries, citing local hospitals. [Update, 5:10 p.m. ET] Hospitals now say they are treating as many as 51 wounded after the bombings. Two people have been killed, according to Boston police. [Update, 5:09 p.m. ET] It will take a long time to clear the area, because lots of people dropped bags and whatever else they had when the finish-line blasts happened. Authorities have to check all of those bags, and bomb squads "may be blowing things up over the next few hours" out of precaution, Boston Police Commissioner Ed Davis said. Side problem, according to commissioner: People running from scene dropped bags, and personal belongings in the street. All must be checked. Thousands of runners still had yet to finish the race when the bombs exploded in a spectator area along Boylston Street near the finish line, CNN executive producer Matt Frucci at the scene. - A third explosion happened at the John F. Kennedy Presidential Library "about a half-hour ago." The library is about 5 miles southeast of the Boston Marathon finish line. 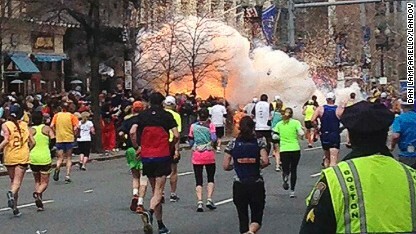 - Police don't immediately know whether that explosion is related to the two near the Boston Marathon finish line. 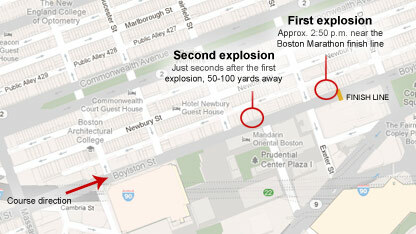 - The two blasts near the finish line - along Boylston Street near Copley Square - "happened 50 to 100 yards apart." - "We're recommending to people that they stay home ... and that they don't go anyplace and congregate in large crowds." - Relatives of people who may be missing in the area can call the mayor's hotline at 617-635-4500. - Anyone who has information about the bombings or saw anything suspicious can call 1-800-494-TIPS. [Update, 4:46 p.m. ET] Massachusetts Gov. Deval Patrick says “this is a horrific day in Boston." A man lays on the ground after the explosions in Boston. [Update, 4:45 p.m. ET] It appears that so many people are using cell phones in the center of Boston, consistent service is hard to get - and the overload is hampering the investigation, two federal law enforcement sources tell CNN. 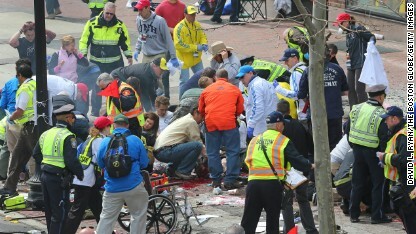 A person who was injured in an explosion near the finish line of the Boston Marathon is taken away from the scene. Outside MGH: Head of emergency medicine says 19 have been brought to MGH, six critically injured, some with amputations. "Outside MGH: Head of emergency medicine says 19 have been brought to MGH, six critically injured, some with amputations," she posted to Twitter. Earlier, we noted that Boston.com sports producer Steve Silva reported that he "saw dismemberment" and "blood everywhere." [Update, 4:37 p.m. ET] Organizers with the London Marathon, scheduled for this coming Sunday, have taken notice. "We are deeply saddened and shocked by the news from Boston," London Marathon officials said Monday. "Our immediate thoughts are with the people there and their families. It is a very sad day for athletics and for our friends and colleagues in marathon running. Our security plan is developed jointly with the Metropolitan Police and we were in contact with them as soon as we heard the news." [Update, 4:30 p.m. ET] Boston firefighters have found what they believe is an unexploded device after the blasts, a government official said, according to CNN's Joe Johns. Police officers with their guns drawn hear the second explosion down the street. The first explosion knocked down a runner at the finish line. [Update, 4:27 p.m. ET] "I saw blood everywhere," Boston.com sports producer Steve Silva told Boston.com. 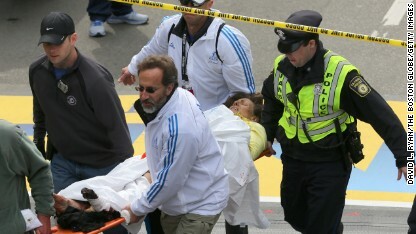 Silva told the news outlet that he was near the finish line when the explosions happened. He said he saw a number of injuries in the area where spectators were. He saw "someone lost their leg," and he said "people are crying, people are confused." "It was just an explosion, it came out of nowhere," he said. "There are multiple injuries. I saw dismemberment, I saw blood everywhere. People are badly injured." [Update, 4:19 p.m. 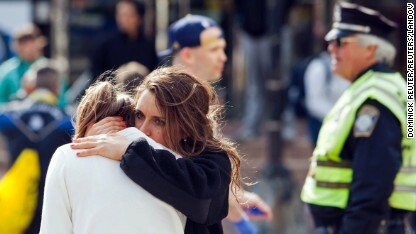 ET] We have a new injury count: According to hospital officials, at least 28 people are being treated for injuries connected to this afternoon's blasts near the Boston Marathon finish line. Nineteen were being treated at Massachusetts General and nine at Tufts Medical Center, officials at those facilities said. Boston police earlier put the number of victims at two dead and 22 hurt. A person who was injured in an explosion near the finish line of the 117th Boston Marathon is taken away from the scene in a wheelchair. [Update, 4:16 p.m. ET] "People started scrambling, pushing, shoving" when the explosions happened in a sidewalk area along Boylston Street, near the finish line in the Copley Square area, says CNN executive producer Matt Frucci at the scene. Frucci said he heard the blasts. "After the dust settled, (I saw) six or seven people strewn about the area where the second (explosion) was. Emergency personnel respond to the scene after two explosions went off near the finish line of the 117th Boston Marathon on April 15, 2013. [Update, 4:11 p.m. ET] A Red Cross website has been established to help people find loved ones in the area. "Individuals can register themselves as safe or search for loved ones," Massachusetts' emergency management agency says. [Update, 4:08 p.m. ET] At least two people have been killed and 22 are injured in the apparent bombings near the finish line of the Boston Marathon, Boston police say. An explosion rips through a location near the finish line of the Boston Marathon. [Update, 4:02 p.m. ET] A Massachusetts General Hospital spokeswoman tells CNN 19 victims have been brought in. [Update,3:57 p.m. ET] On their Twitter page, Boston marathon officials made this announcement: "There were two bombs that exploded near the finish line in today's Boston Marathon. We are working with law enforcement to understand what exactly has happened." [Update, 3:53 p.m. ET] New York is taking precautions as a result of the explosions at the Boston Marathon. In a written statement, New York Police Department Deputy Commissioner Paul Browne said: "We're stepping up security at hotels and other prominent locations in the city through deployment of the NYPD's critical response vehicles until more about the explosion is learned. [Update, 3:45 p.m. ET] Paramedics were treating several victims at the scene, and police ordered onlookers to back away from the area. Troops from the Massachusetts National Guard were assisting police as well. 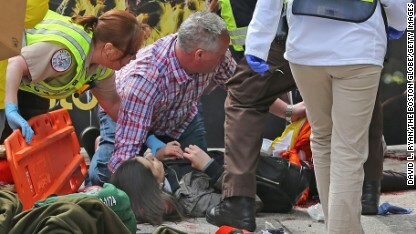 [Update, 3:37 p.m.] Four victims of explosions near the Boston Marathon finish line are at the emergency room at Massachusetts General Hospital, a hospital spokeswoman told CNN. She had no information about the victims' conditions. [Posted at 3:25 p.m. ET] A pair of explosions rocked the finish line at the Boston Marathon on Monday afternoon, injuring at least a half-dozen people, a CNN producer at the scene said. The blasts occurred a few seconds apart, shrouding downtown Boston's Copley Square in smoke. Paramedics were treating several victims at the scene, and police ordered onlookers to back away from the area, CNN Producer Matt Frucci reported. The explosions occurred about 2:45 p.m., about an hour after the first runners had crossed the finish line, Frucci said. Very shameful ACT. All the people responsible should be PUNISHED and strict action should be taken against them. I have noticed that credit restoration activity should be conducted with techniques. If not, you can uncover yourself endangering your rank. In order to realize your aspirations in fixing your credit rating you need to confirm that from this moment in time you pay all within your monthly dues promptly in advance of their planned date. It is significant on the grounds that by not accomplishing that, all other steps that you can decide to try to improve your credit positioning will not be effective. Many thanks for expressing your ideas. I will put it simply. Make an example out of this Kid!